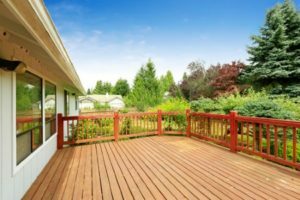 A deck is a great place to spend time with your family and friends during warm summer days or nights. Of course, that’s only true if you have a safe and sound outdoor living space of this type. Deck safety is something few people think about even though the entire month of May is dedicated to this exact focus. So, why not learn now some ways you can encourage deck safety. That way, come spring, you’ll be ready for the new season with safety guidelines in mind. You and your whole family will benefit from this. Not to try to scare you but decks do have problems and sometimes there are no warning signs. First and foremost, only work with a reputable and established deck builder for this type of work. Flashing is among the most common reasons that your deck may have a problem. In fact, in cases of shoddy workmanship, it’s been discovered that no flashing was installed in the first place. Flashing is what connects your deck to your home. If it is compromised or missing, this enables the wood to rot and the attachment to your home will no longer be secure. The stairs and railing should be inspected periodically. Aside from rot, look for other potential issues like nails sticking out or trip hazards. Steps can be perilous even without added risk so make sure yours are in good condition. Make it a point to add lighting here too. Have the wood inspected or at least check it yourself every so often. Use an ice pick or something similar to make sure you can’t penetrate the wood more than 1/2” without it splintering. If it does splinter, it means you have decay and need to have it repaired. Keeping the deck stained will help reduce the chances of this happening. Partner with Omni Builders for superior work from deck builders in Montgomery, MI. We’re more than just a superior pole barn construction company, we also do decks. If you are looking for an experienced deck builder then please call 517-486-3784 or complete our online request form.